During my visit to Jordan a couple of years ago, I spent 2 days in the desert in Wadi Rum. At the beginning of my visit I was taken to this rocky outcrop, with stunning views of the surrounding desert, with steep rocky hills in the distance. It’s a very harsh, barren landscape – so I was extremely surprised to suddenly see a cat appear from the shade of the rocks ahead of me! She wasn’t hungry or thirsty, she was just happy to have some company! Petra was on my “to visit” list for a long time before I finally made it there last year, and after 3 days there I can say that it should be on every traveller’s bucket list. Words can’t describe the feeling when you first walk down the narrow Siq that suddenly opens up to reveal the splendour of the Treasury. The rest of the site doesn’t disappoint either – with an overwhelming sense of history surrounded by spectacular scenery spread over vast distances. Several days are needed to fully explore the city – the hike from the entrance of the Siq to the Monastery for example takes almost 2 hours, depending your level of fitness. On my first day there I visited the Street of Facades, shown in the center of this picture. These are tombs, with impressive facades carved into the colorful stone. The most elaborate were for the rich, while there are more simple and smaller tombs for the poorer people. 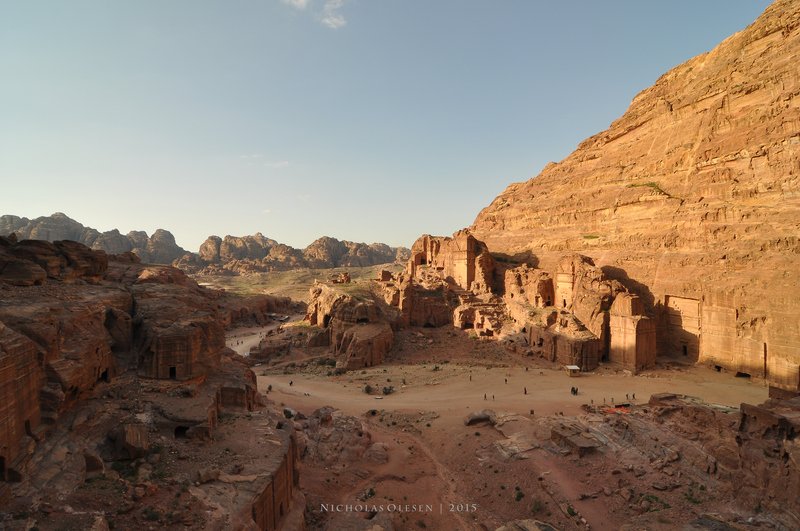 At the end of the day I looped up behind the theater (via the path leading to the left in the picture and then Wadi Farasa, approximately a 2 hour hike) to the High Place of Sacrifice, where the Nabateans are believed to have carried out religious ceremonies and sacrifices. On the way down, taking the more direct route down to the valley floor, the golden light highlighted the Street of Facades where I had spent several hours earlier in the day. Wild camels used to roam the deserts of the Middle East; these days they are widely used for racing and, as a result, there are no wild camels left in Jordan. 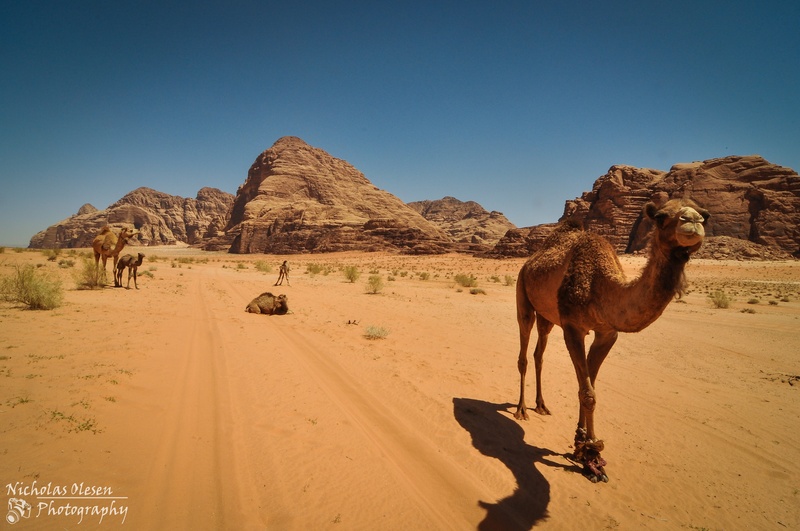 The camels above are owned by local Bedouin people, but have been hobbled and are then allowed to roam the desert of Wadi Rum to graze for months at a time, without travelling too far away from “home”. In the background a baby camel, only a few days old, is still learning to walk. 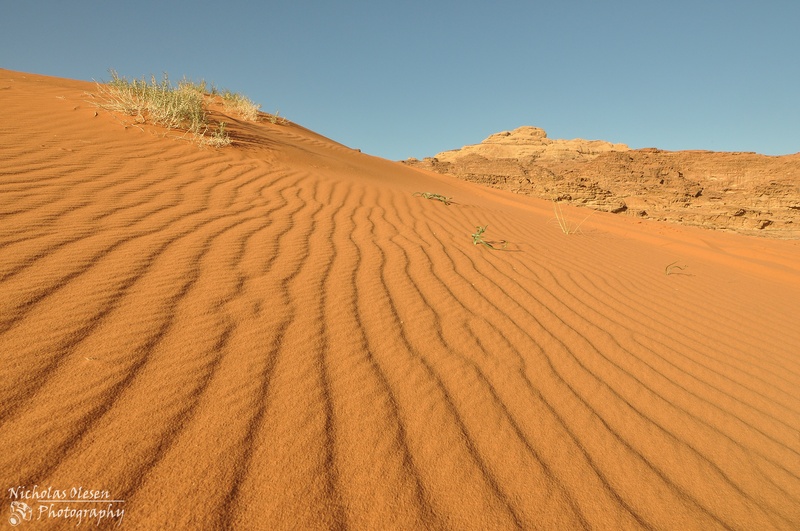 Ripples formed by the wind in the sand of Wadi Rum, southern Jordan. 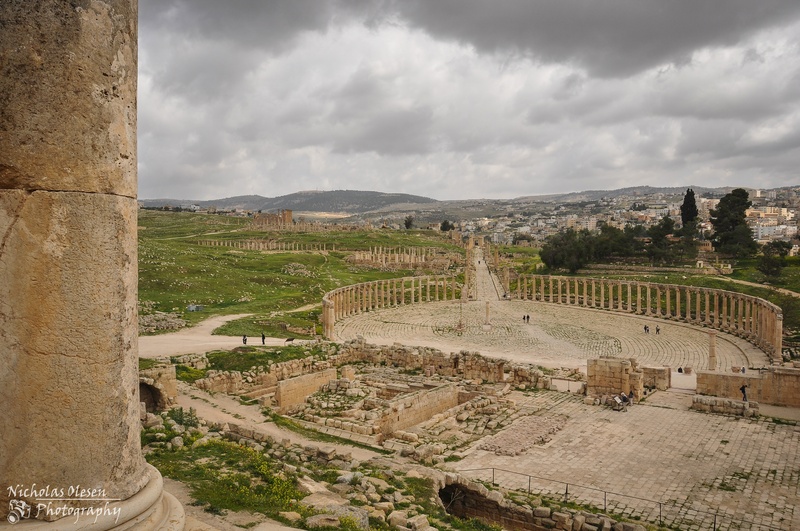 A view of the oval-shaped Forum and the main street (Cardo Maximus) of the ancient Roman city of Jerash. The ruins are located just north of the Jordanian capital, Amman. 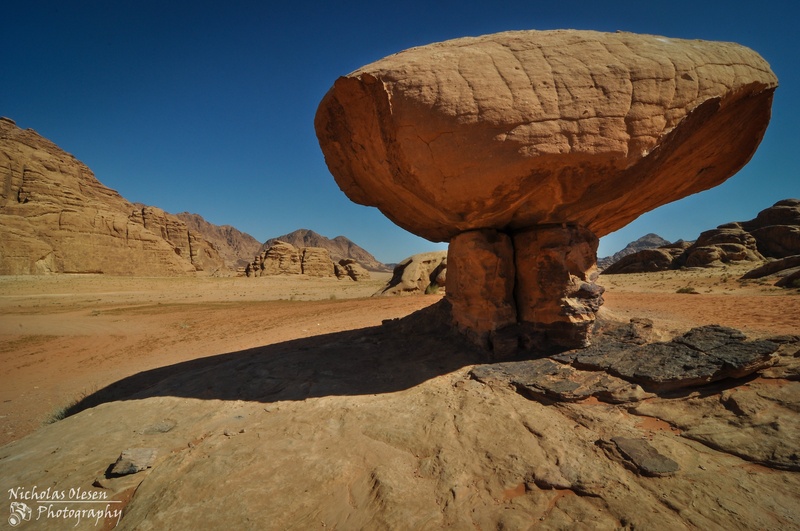 The so-called “Mushroom Rock” due to it’s form, in Wadi Rum in southern Jordan.